The 8KCAB Decathlon and Super Decathlon are two-seat fixed conventional gear light airplanes designed for flight training and personal use and capable of sustaining aerobatic stresses (+6/-5 g loads). The Decathlon entered production in the United States in 1970 as a more powerful and stronger complement to the Citabria line of aircraft. The Decathlon was designed by the Champion Aircraft Corporation, and is a derivative of the 7-series Citabrias. While the Citabria designs were and remain successful, and the 7KCAB variant of the Citabria had even added limited inverted flight capability, the Citabrias are not capable of “outside” maneuvers, those requiring significant negative-g loads. Pilots wanted an aircraft capable of more maneuvers, and the 8KCAB Decathlon was Champion’s answer. The Decathlon entered production at Champion in 1970, immediately before the company was acquired by Bellanca Aircraft Corporation, so only a handful were produced by Champion. Bellanca continued production of the Decathlon throughout the 1970s, moving to the Super Decathlon variant during 1976. Bellanca built over 600 of the 8KCAB design before production of the aircraft was interrupted when the company's assets were liquidated in 1981. The Decathlon design passed through the hands of a number of companies through the 1980s, including a Champion Aircraft Company which was no relation to the Champion Aircraft of the 1960s, but no Decathlons were built in that period. 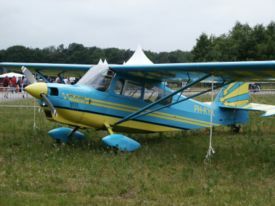 American Champion Aircraft Corporation acquired the Decathlon design, along with the 8GCBC Scout and the group of Citabria and Champ variants, in 1990, bringing the Super Decathlon version back into production that same year. It is still being produced. The Decathlon traces its lineage back to the Aeronca Champ, by way of the Citabria. Like the Citabria, the Decathlon features tandem seating and joystick controls. The fuselage and tail surfaces are constructed of welded metal tubing. The outer shape of the fuselage is created by a combination of wooden formers and longerons, covered with fabric. The cross-section of the metal fuselage truss is triangular, a design feature which can be traced all the way back to the earliest Aeronca C-2 design of the late 1920s. The strut-braced wings of the Decathlon are, like the fuselage and tail surfaces, fabric covered, utilizing aluminum ribs. The wings of Champion and Bellanca Decathlons were built with wooden spars. American Champion has been using aluminum spars in the aircraft it has produced and has, as well, made the aluminum-spar wings available for retrofit installation on older aircraft. Compared to the Citabria’s wingspan of 33.5 feet, the Decathlon’s wingspan is shorter, at 32 feet. One of the major developments of the 8KCAB Decathlon over the 7KCAB Citabria is the Decathlon’s wing, which employs a semi-symmetric airfoil, as opposed to the Citabria’s flat-bottomed airfoil. This change gives the Decathlon better inverted flight and negative-g maneuver capabilities. The landing gear of the Decathlon is in a conventional arrangement. The main gear legs of most Decathlons are made of spring steel, though American Champion began to use aluminum gear legs in 2004. Like the 7KCAB, the engine of the 8KCAB has a fuel injection system, as opposed to a carburetor. Along with this, to facilitate negative g flight, the fuel system incorporates a 1.5 gallon header tank beneath the instrument panel, and the engine is fitted with a Christen Industries inverted oil system. Champion and Bellanca built the Decathlon with several Lycoming IO-320 engine variants, all of 150 horsepower, and with the choice of a fixed-pitch or constant speed propeller. The major improvement in Bellanca’s introduction of the Super Decathlon was the change of engine to the Lycoming AEIO-360-H1A or –H1B, both of 180 horsepower, which was accompanied by a selection of constant speed propellers. The American Champion Super Decathlon utilizes the AEIO-360-H1B, along with a constant speed propeller. Though the Decathlon went out of production within a decade of its introduction, this was not due to any fault in the design but rather to the slump in general aviation in the United States at the end of the 1970s and the beginning of the 1980s. Since its reintroduction, the Super Decathlon has sold steadily. Decathlons and Super Decathlons remain popular as aerobatic trainers, as beginning and intermediate aerobatic aircraft, and as personal aircraft. American airplanes: Al - av. Aerofiles: A Century of American Aviation. Retrieved on 2006-08-12. American airplanes: Ca - ci. Aerofiles: A Century of American Aviation. Retrieved on 2006-08-12. Bellanca. Aerofiles: A Century of American Aviation. Retrieved on 2006-08-12. Super Decathlon Specifications. American Champion Aircraft Corporation: Super Decathlon Model 8KCAB Specifications. Retrieved on 2006-09-24. Type certificate data sheet no. A21CE. Revision 13. (Oct. 14, 2004.) Department of Transportation. Federal Aviation Administration. This page was last edited on 5 March 2007, at 00:34.